For the first time, to my delight, I’ve found garlic scapes in one of my local shops. They are thicker than Chinese garlic stems (suan tai 蒜薹 , suan miao 蒜苗 , suan xin 蒜芯 – they have different names in different parts of China), with much larger bulbs, but have a similar flavour. Of course I cooked them in my favourite Sichuanese way, stir-frying them with a little streaky smoked bacon. With wok-scrambled eggs and a beansprout salad, they made a glorious lunch. 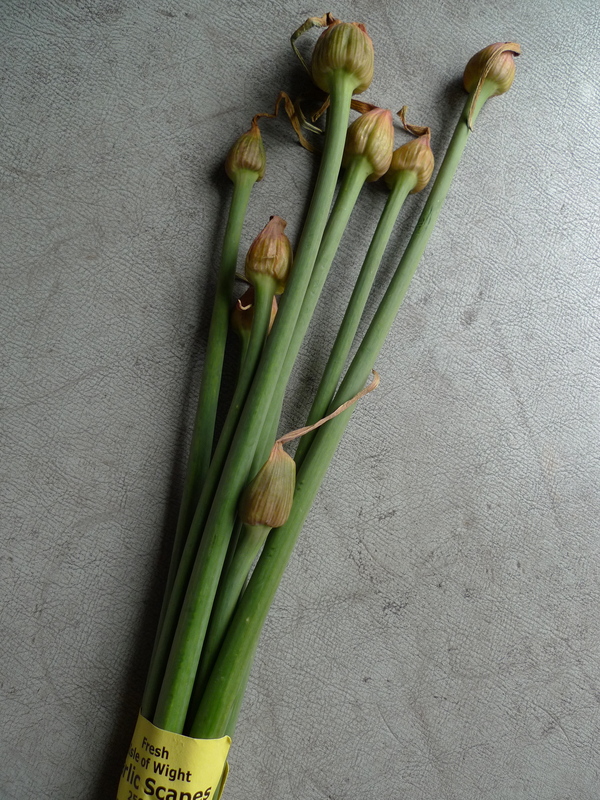 These scapes come from The Garlic Farm on the Isle of Wight, just off the coast of southern England. we’re way ahead of you! bought a huge bag of scapes at a farmers’ market a few weeks ago, and thought what to do – any of f. dunlop’s garlic chive recipes will do. so fried them up with bacon and they were delicious. enjoying the new book very much – but a question. why are there recipes from your previous books? what not all-new material? Glad you’re enjoying the new book! I wanted to include some ‘greatest hits’ from my previous books, as well as versions of some very basic recipes that are staples of everyday cooking because I wanted this one to be a good all-rounder, and one that represents the dishes I find myself making most on a regular basis. 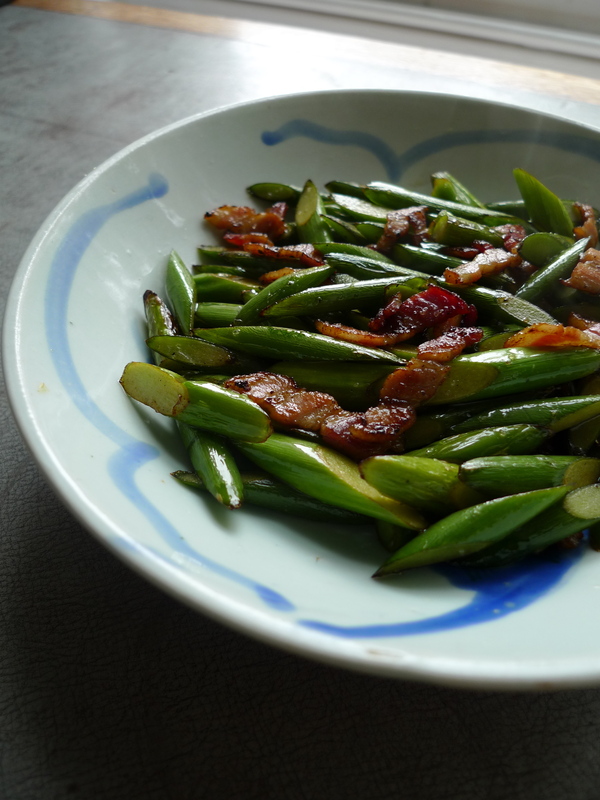 I’m hoping that, with the emphasis on quicker, healthier recipes, and the wonderful photography, that it will entice new people to experiment with Chinese cooking. In this sense, the purpose of the book is different from that of my previous recipe books, which were intended to be explorations of specific regions. i’m giving the book to a lot of friends, because i think this is the one, that could really get them started on Chinese cooking, to add to their repertoire of Italian, southern French, new American etc. i’m currently reporting a story on ‘cooling’ Asian foods, for the summer – is there anything traditional, or does something come to mind, that might make an unusual ‘new summer classic’ for people. i took note of all the cold dishes in the new book. Hi Fuschia! Cooking this tonight with some standard smoked supermarket ‘la rou’ 腊肉 that you can buy here in Fuzhou – it’s always quite hard and although nice, I’m wondering if you’ve got any tips for the best type of smoked meat you can buy for dishes like this one? Have you tried steaming the larou first, to cook it, and then slicing it? This is normal practice with Chinese larou, and I think softens it a bit. I’m afraid I’m not sure about specific brands – best, of course, would be home-smoked meat from a home-reared pig!